Magic Triangle Math Fun For All Ages. Ready for some more magic triangle fun? If you've already tried the easier ones, these are a little bit tougher. Great way for students to build critical thinking skills while they're having fun. 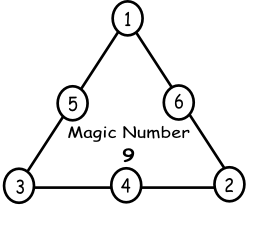 Just in case you don't know how a magic triangle works, all of the numbers in each row of the triangle must add up to the same number (Magic Number). See picture below. Here's a magic triangle pictured on the left that's already been worked out. 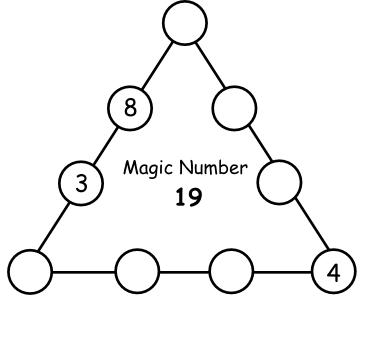 The Magic Number for this triangle is 9. Notice that the sum of each of the three sides of the triangle is 9. So now let's try to do some triangles that are just a bit tougher. These magic triangles have four numbers on each side instead of three. But they're still worked out the same way. So you can see we've filled out a few of the numbers for you already to make it a little easier. The magic number for this one is 19. The student's task is to fill in the missing numbers so that the sum of each side totals 19. Print the triangles here. Make sure your students try to work it out first before giving them the answers. Print the solutions. Math puzzles help students who hate or are frightened of math, to have fun while developing thinking skills at the same time. Help increase numeracy skills and logical thinking. Help students with developing concentration as well as perseverance. By the way if you haven't checked out the magic squares page, you might want to try those too. Adding two and three-digit numbers with these cool Circle Addition Puzzles! If you haven't tried these with your students yet, now's the time! Great for building mental math addition skills.